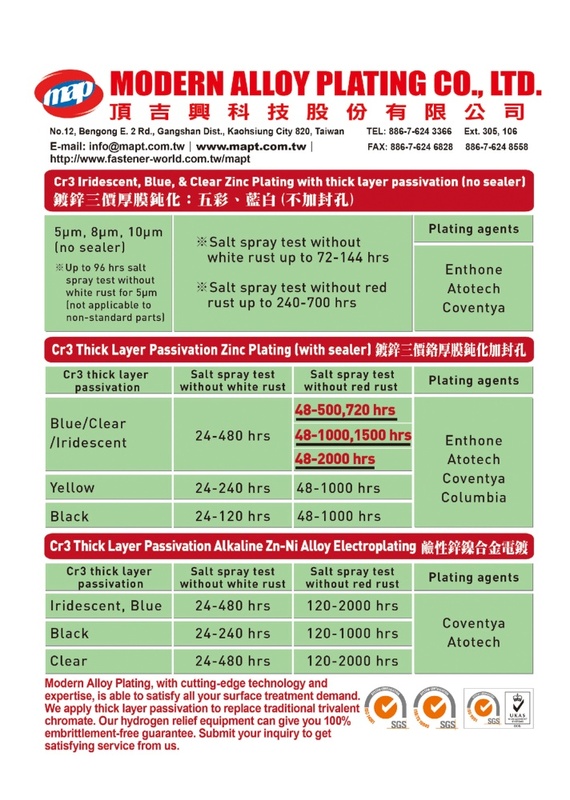 Established in 2005, Modern Alloy Plating Co., Ltd. mainly provides surface treatment such as Electrocoating, Zinc-Nickel Alloy Plating, Zinc-Iron Alloy Plating, Acid Zinc Plating, Mechanical Zinc Galvanizing, and Electrolysis Polishing for High-Corrosion Resistance Stainless Steel and other applications. Based on the Environmental Science & Technology Park, Benzhou, Gangshan Township, this alloy plating factory was constructed in November 2006, having the area of 8,625 square meters. The entire design of the factory is in line with the German standard, and most of the equipments are imported from Europe. It not only introduced the first ion exchanger (an automatic recycling and quality control system for passivation solutions) in Taiwan, but it also differs from traditional factories it controls the quality with its professional staff members. The ion exchanger not only avoids contaminations with foreign substances, but also controls the quality (passivation solution compound) precisely. In addition, each treatment bath is equipped with own rectifier; therefore it costs much more than ordinary facilities provided with only one rectifier for every three bathes. With so much investment made in this alloy plating factory, Modern Alloy Plating has sufficient confidence in services for the fastener industry in Taiwan. Our processing facility comprise plating lines, passivation lines, sealing lines, temper ovens for hydrogen relief, in-procecc control, and passivation solution recycling systems (all full automatic and computer-controlled). Our laboratory is equipped and control quality with Salt Spray Testers, UV Spectrophotometer, Atom Absorption Spectrometers, X-Ray Plating Thickness Tester, Mini Barrel Plating Machines, Hull Cell Tester, Potentiometric Titration, and a internal chemical analysis. Additional we can precisely check all dimensions of your parts with our newest Automatic Optical Sorting Machine. All these accurate equipments are controlled by specialized talents. Modern Alloy Plating has currently become one of the biggest automatic alloy-plating factories in Taiwan, and all of its major customers are the ones producing automobile fasteners, construction fasteners and hardware. Furthermore our factory and laboratory will steadily extended, our processes improved and new products and technologies developed and introdruced. Surface treatment is, besides material and technology, very important for highly valued products. So Taiwan's surface treatment industry has and will further increase in added value under guide role of Modern Alloy Plating.